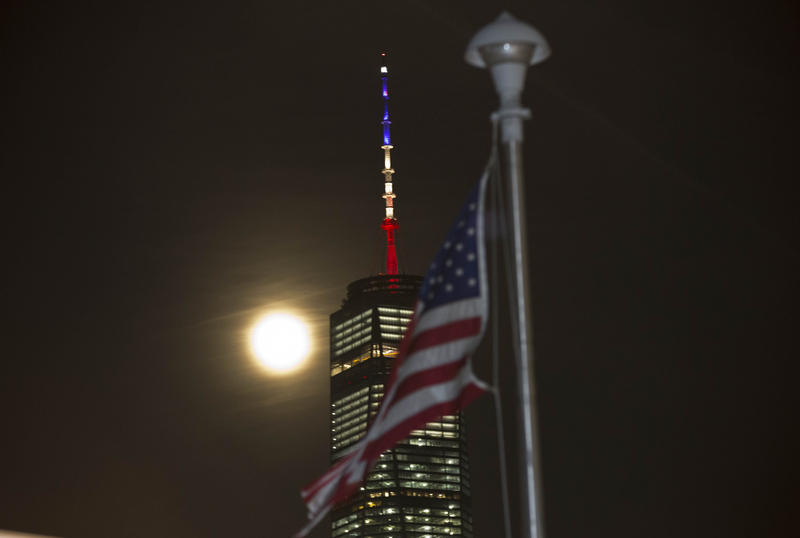 A well-meaning gesture turned a little awkward Tuesday evening when One World Trade Center was lit in the wrong flag colors after the senseless terrorist attacks that took place in Belgium earlier in the day. The spire of the iconic building, which stands in the very spot where a terrorist attack brought down the twin towers on Sept. 11, 2011, was supposed to be cast in the colors of the Belgian flag — black, yellow, and red lights — but photos that quickly circulated online showed red, white, and blue lights were used instead. Some have suggested that the red, white, and blue is meant to symbolize America's solidarity with Belgium, but they appeared to directly contradict a statement made by New York Gov. Andrew Cuomo earlier in the day. "Tonight, One World Trade Center will be displayed in black, yellow and red as we stand in solemn solidarity with the people of Belgium, just as they have done for us in the past," Cuomo said. "We join the world in mourning the victims of these attacks and remain committed to helping create a more just and peaceful world." The Empire State Building, which was cast in the French colors blue, white, and red after last November's attacks, remained dark. The terrorist attacks in Brussels on Tuesday killed at least 34 and injured another 250, and other countries across the world quickly rose in solidarity with Belgium, which in recent months has become a hotbed for terrorist activities. Paris' Eiffel Tower, Berlin's Brandenburg Gate, and Dubai's towering Burj Khalifa all showcased Belgium's flag colors Tuesday evening. But standing hand-in-hand in the face of terrorism takes more than just a few lights. New York's gaffe, as slightly embarrassing as it was, doesn't diminish America's heartache at the horrifying attacks. President Obama pledged U.S. support to Belgium while on his historic trip to Cuba, saying, "We will do whatever is necessary to support our friend and ally Belgium in bringing to justice those who are responsible." And just as Americans stepped up to say, "Je suis Paris," after last November's attacks, they, too, are proud to say, "Je suis Bruxelles."